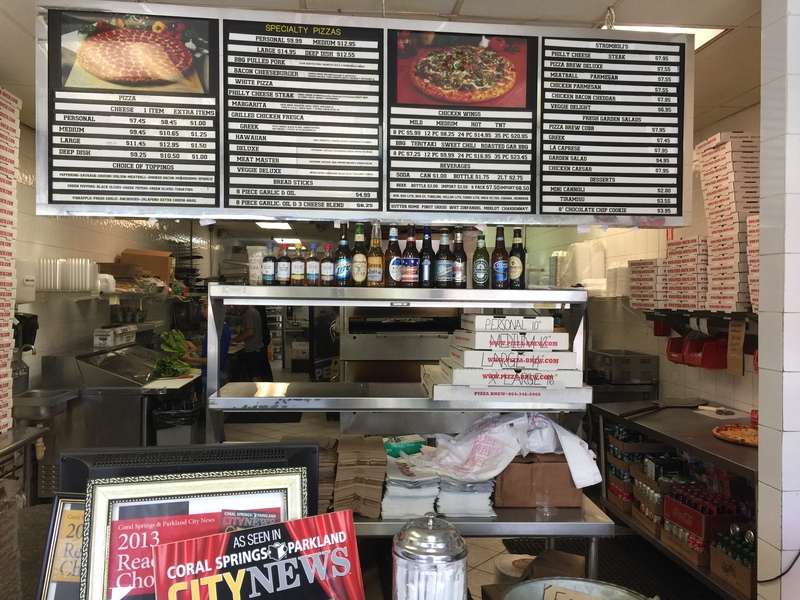 Pizza-Brew: Hole In the Wall With Damn Good Food! Awarding Winning Wings at a Pizza Place! I’ve been here or had food delivered from this joint maybe six times. 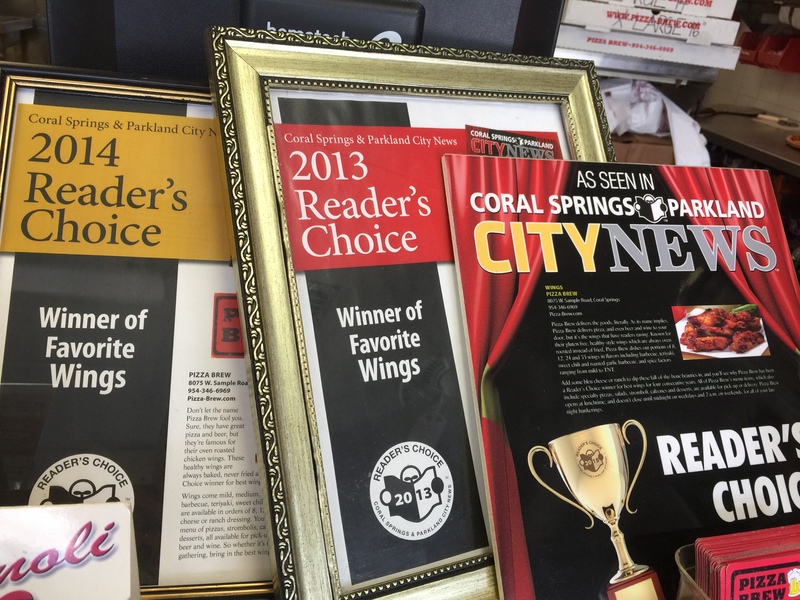 I recently decided to type a review when I walked in to order a pie and saw that they won multiple awards for Best Wings. I was confused since the name on the outside says “Pizza-Brew” and not Wings-Brew. I didn’t see any awards for best pizza. I’m always skeptical when I see these awards of “Best Of…”. Since I already ordered my pizza and wasn’t hungry for wings, I decide to order delivery another time and then do a review. It’s hard to even know this place exists. They don’t have a social media presence and they don’t advertise. Why did I even order from this place the first time? Simple, I found out the people that own this also own Annie’s Pizza on Wiles Road. I’m a fan of Annie’s pies so when I found out this location was closer to my home, I was stoked. Not sure why it wasn’t named Annie’s but I would imagine they were trying to launch a new concept. Besides food, they also deliver beer/wine, too. 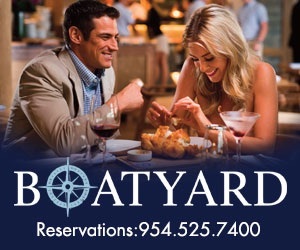 Not a new concept, but I don’t know any other business out in Coral Springs that delivers food and beer/wine. 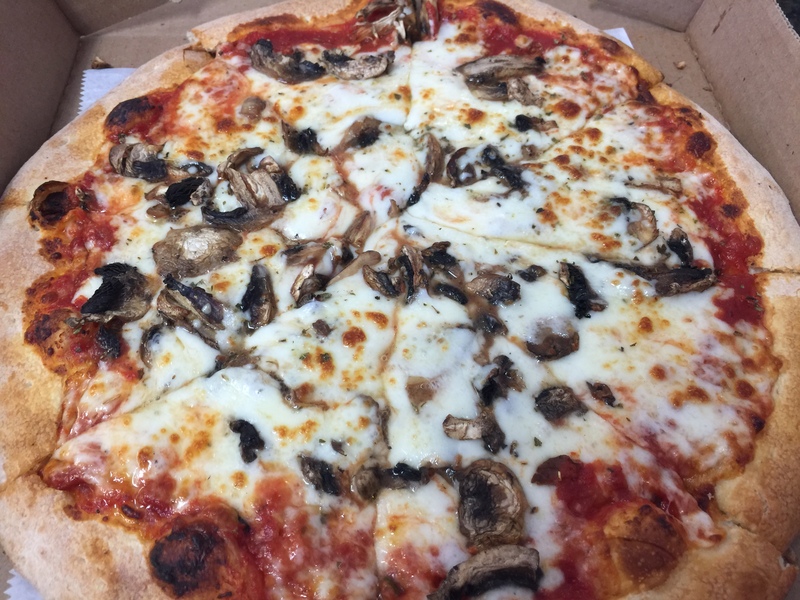 The best thing about this pizza is the price. They have a special…2 large pies with two toppings on each for 20 bucks. 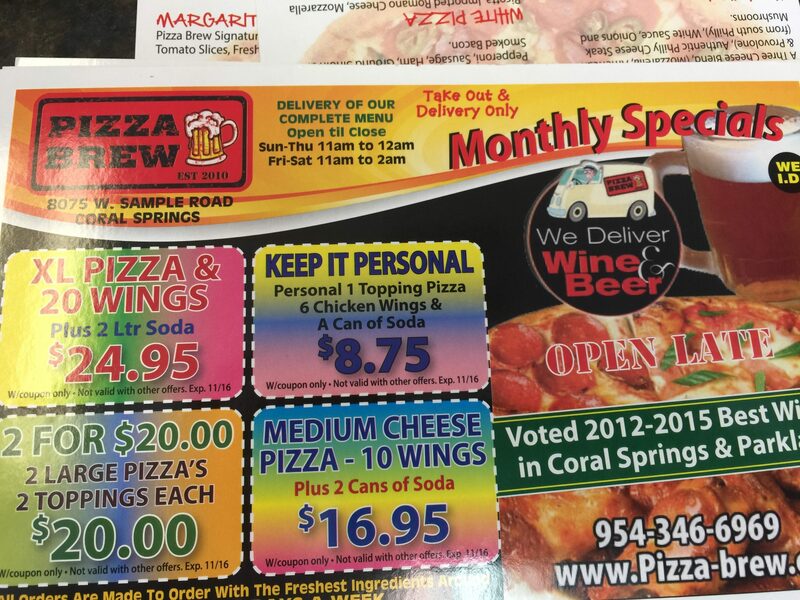 They have other specials, too, but the pizza one is what I get. 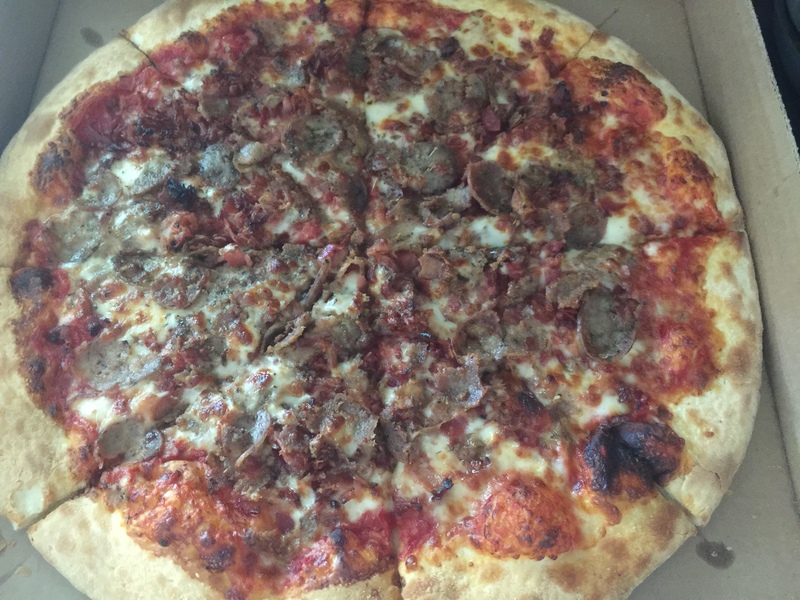 I order one pie with sausage and bacon and the other extra cheese and mushrooms. I also order cheese bread and 8 wings hot, drums only. The food is delivered promptly and everything is nice and hot. Both pies look awesome, the cheese bread is huge, and the wings are big and meaty. I decided to taste the “Best Of Wings” first so my taste buds are fresh LOL. 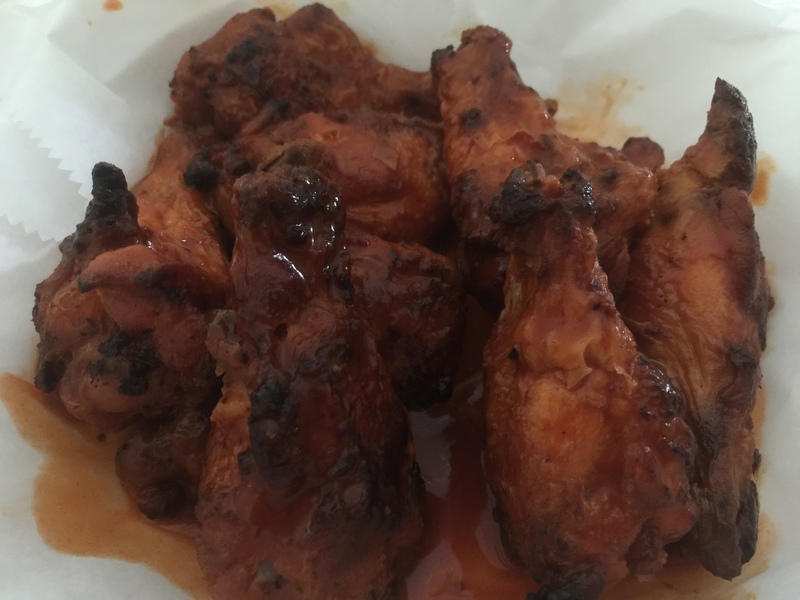 These wings are dubbed “Healthy Wings” because they are oven baked and not fried. I’m not the biggest fan of oven baked wings. I prefer mine fried or grilled or both. I admit these wings had a nice char on them. The hot sauce had to be a butter and Franks hot sauce mixture or something pretty damn close. These wings were damn good! Like I said, they were big meaty wings and juicy, too. I really enjoyed them. As I’m eating, I’m thinking why haven’t I heard about the wings here? Somebody must be eating them and saying they are good if it’s winning awards. I can’t believe I’m going to type this but these wings are some of the best I’ve had in Coral Springs. What makes that statement crazy is you can’t even dine in this restaurant. There is one small table and that’s it. It’s a take-out/delivery joint. Great job with the wings! The cheese bread came in a large pizza box. 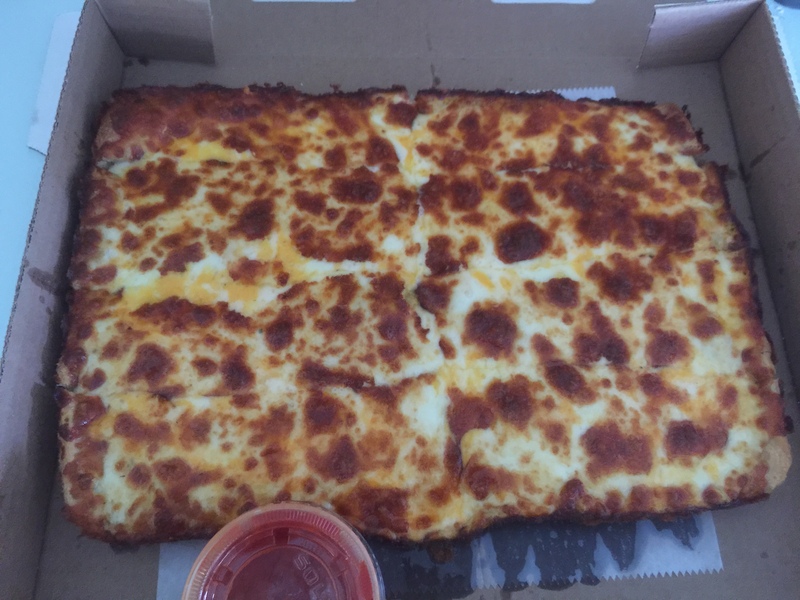 It’s rectangular with the slices cut in smaller long rectangles and covered in a mix of cheeses on thick crust with a side of pizza sauce. I grab one cheese bread slice and it’s just oozing cheese man. This thing is dynamite! As for the pizza…for being cooked on conveyor belt, it’s pretty good. Nice balance of cheese and sauce. I liked the dough, too, because it tastes like Annie’s Pizza. They have to be using the same recipe. This one is hard. There is no ambiance to this joint at all. They cook pizza on a conveyor belt. I can only compare this place to a Papa Johns, Dominos or a Pizza Hut that is delivery only. With that said, Pizza- Brew blows them all away. The bonuses of ordering from here are the damn good wings, beer/wine delivery, and it’s a mom and pop place. To be clear, the pizza is NOT the best I’ve ever had because this is fast food pizza. If the pizza is not cooked in an oven, I’ll never say it’s the best. As for the wings, $hit, you have the try them and be your own judge. These wings are not even in the same league of the pizza joints I listed above. They should be judged with a Leftys, Wings Plus, Sicilian Oven, Anthony’s Coal Fire Pizza, Pasquales or even my favorite wing place, Calypso Pub. 4 Beers for you Pizza-Brew! When you order tell them Dan I Cook sent you and Stay Hungry!